This paper identifies areas of cooperation that will help companies achieve their sustainability goals and support countries’ need to lower emissions from land use. The last five years have seen an encouraging surge in corporate commitments to deforestation-free supply chains. Adopting sustainability commitments is a lot easier, however, than achieving them. Many are finding that reducing deforestation is much harder than expected. The production of deforestation-free products is hampered by, among others, lack of land-use planning, weak law enforcement, and insufficient monitoring and accountability systems. At the same time, many governments of developed and developing countries have embarked on joint efforts to formulate and support new policies and measures that can reduce carbon emissions from forest loss. Adding momentum to such efforts, the Paris Agreement on climate change obligates all countries to reduce emissions and develop low carbon pathways. Governments seeking to reduce greenhouse gas emissions and private actors seeking to ensure sustainability across their supply chains are, in fact, aiming for similar outcomes and face the same challenges. In this regard, the Paris Agreement provides a unique opportunity for new public-private partnerships. Funding for this report was provided by the U.S. Department of State, Bureau of Oceans and International Environmental and Scientific Affairs. This report was prepared by a consortium led by Winrock International with Climate Focus, Meridian Institute, and a team of expert authors. The report should be cited as: Streck, C., and Lee, D. 2016. 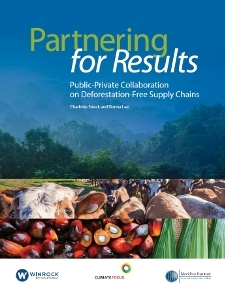 “Partnering for Results: Public-Private Collaboration on Deforestation-Free Supply Chains.” Prepared with support from cooperative agreement # S-LMAQM-13-CA-1128 with U.S. Department of State.